On Sunday, Ernesto became the first hurricane of the 2006 Atlantic Hurricane Season with maximum sustained winds reaching 75 mph. However, after moving over the mountainous terrain of southwestern Haiti, Ernesto weakened to a tropical storm by Sunday afternoon. Ernesto is now over the mountainous terrain of eastern Cuba. Once Ernesto emerges from Cuba later today, it will begin to turn more to the north as it moves around the edge of an area of high pressure located east of Jacksonville, Fla., in the mid-levels of the atmosphere and also begins to be picked up by an approaching upper-level trough digging into the Mississippi River Valley. 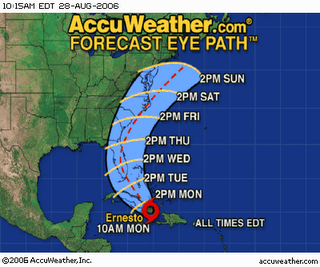 This will take Ernesto to or very near South Florida by late Tuesday. Just how much the mid-level ridge of high pressure weakens will determine just how far east or west Ernesto tracks when it gets toward South Florida. Although the best case scenario now still favors a track northward across the Florida Peninsula, there is also the potential for Ernesto to pass just along or just off the east coast of Florida. Ernesto's intensity at its approach to South Florida is also highly dependent on just how much time it spends over Cuba. The quicker Ernesto can get back into water, the stronger it will likely be when it arrives near South Florida. Ernesto will move over very warm waters as well and will be in an area where the upper-level winds are light and favorable for further development; therefore, it is not unreasonable for Ernesto to become a hurricane by the time it makes a landfall or is near the coast of South Florida. The fringe effects of Ernesto will be felt in South Florida by early Tuesday with conditions rapidly deteriorating as the day progresses as the outer squalls of Ernesto work northward. Strong winds and heavy bands of rain will be the main threat and even an isolated tornado or waterspout is possible. Rough surf will also pound the coast, especially in the Keys and along the southeast Florida coast, bringing the threats of storm surge and beach erosion. As time progresses, the effects of Ernesto will work northward into central and northeastern Florida Wednesday and into southeastern Georgia and the low country of South Carolina by Thursday. In time, Ernesto will curve northeast up the East Coast of the United States and it is highly possible that it will be hurricane when it affects these areas as well.